The Process Philosophy of Alfred North Whitehead prioritizes freedom and creativity. The system in its fully developed form is also deeply complex, and its professional discussion is weighed down with jargon. But in its simplest form, process philosophy is about engaging in the process of what we are, what we do, and how we can guide, develop and create our own future. Process emphasizes the space between two points. It's neither the start that's important, nor the end; but the travelling between. In the case of Whitehead, this travelling in between is what makes up reality. That is, Whitehead, in contrast with much philosophical - and everyday - thinking, doesn't regard 'matter' as the stuff of reality, but instead treats 'events' as the most real things that there are. 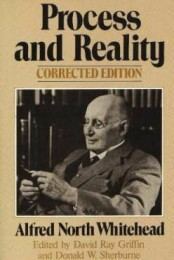 As a philosopher, Whitehead focused on practical matters. He recognized the barrenness of theory without practice, of education in a vacuum, of authority without responsibility, and action without purpose. His aim always was a 'creative advance', the creation and engendering of something new, something novel, something that was in a literal sense 'new under the Sun'. The past was relevant for Whitehead, but not overly so. The authorities of history were interesting, but not to be followed blindly. Experience and adventure, and the risk of the unknown: these are what drove his metaphysics. A key implication of his work is that reality doesn't have to be like 'this' or like 'that'. There's no ultimate reason why we are living in this way, in this world, in this universe. Our existence can be thought of as something like a particular rhythm set within an infinite beat, it being the rhythm that sets the tone of reality. But there is nothing to stop the establishment of new rhythms, new realities. Process philosophy is thus partly an 'aesthetic metaphysic'. What tends to succeed are those rhythms of creating which bring forth the most effective and most elegant patterns. I sometimes think of this as the Collaging of Reality. The following pages provide more information on process philosophy. There is a page of links (mainly, but not all, academic sites), plus some of my own work. I always welcome feedback, suggestions, and creative (constructive) criticism.